What are your favorite military scripture references? How is being a Christian like being in the military? How is it not? In 2 Tim 2:3-5 what are we to do? What are we not to do? What might that look like in your life? In 2 Tim 4:5 what are we to do? Read Ephesians 2:8-10. Have you realized and acted on the two things Paul talks about in verse 10? 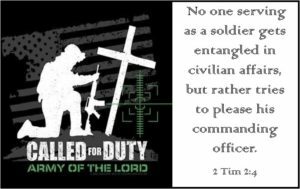 Why was Jesus amazed at the military man in Luke 7:9? According to Ecc. 4:9-12, how smart is it to do life by yourself?